Bake a sheet cake the size that you need. 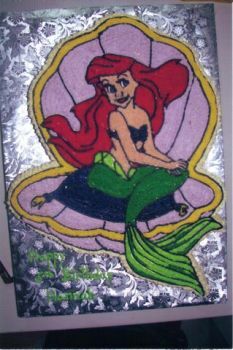 With icing filled bag and tip #5 draw Ariel on the cace top. Cut the cake away from the shape. You will be using the round tip#5 to do all the outline work and the star tip #16 to do all the fill in work. Using a black icing outline the entire Ariel shape and clamshell. Use a leaf green icing and fill in the bottom part of Ariel. Also put a few strips of this color in her tail fin. Make a yellow green icing and fill in her waist and the rest of her tail fin. Her bra and the pillow are filled in with a purple icing. Her eyes are filled in with blue and white icing. Her mouth and hair are filled in with red icing. Make a flesh colored icing and fill in her skin areas. Next fill in the tassles on the pillow with a golden yellow. Also fill in the border all around the clamshell with this color too. Now make a very light purple icing and fill in the clamshell. Fill in the sides of the cake with an ivory icing.